Gastrointestinal Disorders - Becky Dorner & Associates, Inc. Although aging has relatively minimal effects on GI function, age-related changes can cause or contribute to several GI disorders. Patients residing in long-term care facilities typically have numerous concurrent conditions and use numerous medications that may complicate the assessment and treatment of GI disorders. In addition, the presentation of many GI disorders in older people is atypical. 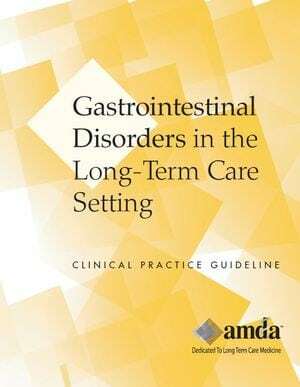 The AMDA Gastrointestinal Disorders in the Long-Term Care Setting Clinical Practice Guideline provides guidance on the prevention of, recognition of, assessment of, and treatment of several GI disorders for clinicians in long-term care settings. State at least 3 age-related changes that can affect GI function. List at least 3 signs and symptoms of gastrointestinal disorders. List at least 3 causes of diarrhea in older adults. 10.2.4 Integrates foundational dietetics knowledge with critical appraisal of assessment data to diagnose nutrition problems (using problem solving, etiology, signs and symptoms [PES] statements), which can be resolved or improved through treatment or nutrition intervention. 10.2.7 Prioritizes specific nutrition problem(s).